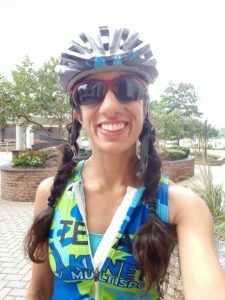 My name is Hina Ayub and I am a marathoner, vegan, physicist, activist, and triathlete. I have competed in 27 marathons to date (including Boston twice), with three more on the schedule for this year, and 23 triathlons, ranging from sprints to half-Ironmans. This year I am tackling my very first full Ironman, and I could not be more excited! As a Kinetic Multisports Ambassador, I hope to share my excitement for this sport and encourage everyone, especially more minorities, to join the triathlon world. When I’m not swimming, biking, or running, I like to do yoga, Pilates, and HIIT. I look forward to seeing you at an upcoming event, and if you hear someone rocking out to Britney pre-race, it’s probably me!